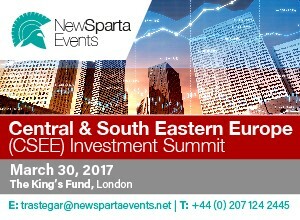 Serbian Private Equity Association is proud to announce its partnership with the Central South Eastern Europe (CSEE) Investment Summit. This event is being held at the Kings’ Fund, London March 30th. The one-day summit will explore how to maximize returns on investment, in light of recent government initiatives across the region and how to overcome current geopolitical challenges, market skepticism, and stagnation. Moreover, understand how to make the most profitable returns on investments based on asset classes and benchmarking. The event will showcase recent investment success stories from the regions’ growing Telecommunication, Technology and Real Estate sectors. • Recent ratings upgrades – with Romania projected to move into emerging market status, what does this mean for investment in the region? • Geopolitical analysis – the impact of Brexit, American and European elections effect investment into CSEE going into 2017?